Tired of looking for Sprockets to fit your Hub? Well, BR Motorsports has the fix to your problem. 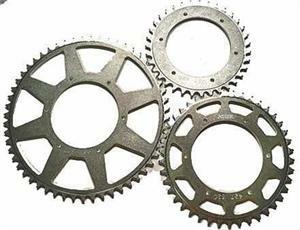 These Aerospace Aluminum Sprockets are the finest you can find anywhere. Built for 6 x 5 1/4 Bolt Center Hubs. These work on Pace, PMP, and Triple X. Available In 46 Through 55 Tooth Count!! PLEASE SPECIFY TOOTH COUNT WHEN ORDERING!